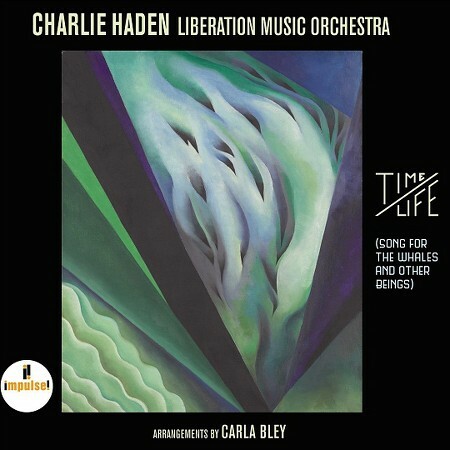 As a delicious taster for the Liberation Orchestra’s appearance at this year’s London Jazz Festival, the release of Time/Life couldn’t be more appropriate. Founded in 1969, the Orchestra was the brainchild of the late bassist and composer Charlie Haden. Its mission was – and is – to highlight issues of a political and social nature. Dream Keeper (1990), for example, was inspired by the racial and political strife in South Africa and El Salvador, and blended South American and African music, jazz, and gospel over its five tracks. As its subtitle suggests, this new release focuses on mankind’s continuing abuse of the environment, and is equally notable as the last recording Haden ever made with the Liberation Orchestra. The signature style of this ensemble is long, slow, evolving music, often consisting of contrasting sections, all rich in melody and emotion, eventually building into an impassioned coda. Blue in Green was recorded by Belgium Public Radio at the 2011 Middleheim Jazz Festival in Antwerp. Arranger and orchestra co-founder Carla Bley’s version of Miles Davis’s (or perhaps Bill Evans’s) spine-chilling ballad is perfectly suited to the subject matter of the album – gorgeously lush, but elegiac in tone, featuring a bass solo from Charlie Haden himself. As this project was being prepared, Haden fell ill. Before he died, he anointed his friend Steve Swallow to take over the Orchestra’s bass chair, which is why it’s the latter we hear on all but the first and last tracks. The three tunes in between were written by Bley, including the title track, introduced by a slow, remorseless military snare drum, in which the wind instruments play a steadily rising chord sequence under the tenor solo. Bley’s second contribution is Silent Spring, a reference to Rachel Carson’s groundbreaking 1962 book of that title - the first to alert the world to the destruction being wrought by pesticides. The tune is written in distinct sections: it starts with a lovely Spanish solo guitar, before the brass comes in with a mournful ostinato which continues with flugelhorn and tenor solos over the top; the tempo then picks up and turns into swing for a lengthy trumpet solo, before subsiding back into the ostinato. Útviklingssang, which first appeared on Bley’s 1981 album Social Studies, is her response to the Norwegian government’s disastrous decision at that time to construct a series of hydroelectric dams in the far north of the country. The final track – Song for the Whales - was, like Blue in Green, recorded live in Antwerp. It begins with Haden using the bass to reproduce the honks and squeaks of whale song. This then evolves into a sort of chase sequence, with the panic-stricken horns as the whales and the rhythm section as their pursuers. The music ends with deeply moving words from Haden about how the whales represent all living creatures, and how we humans are responsible for protecting the natural world.